Pinterest is my new best friend. Seriously, I'll come home from work and ask the cat "What should we do for dinner?" and she's like "?" and then I'll go on Pinterest and find 567,989,843 ideas for dinner. I have found the best broccoli recipe EVER which you should make immediately because broccoli + garlic + roasting = the most delicious thing you have ever eaten. Also, broccoli + eating = healthy, and that's an equation I like to see more of. 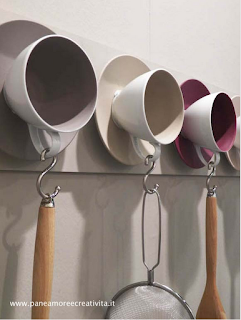 You super glue some teacups and saucers on a board and then use S hooks to hang pots, pans, spoons, etc. from the wall. How cute! How charming! Also, since you control the design you can use whatever color palette works with your kitchen.... and whatever price range works with your budget. Or you can even use ones you are sick of and then it costs practically $0. *It's nice to know Google isn't fluent in Italian either.